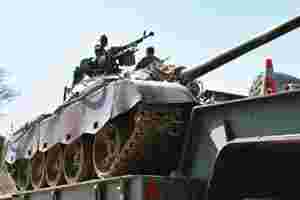 Peshawar: Pakistani forces exchanged heavy fire on Sunday with Taliban defending their heartland, a day after launching an offensive aimed at bringing the writ of the state to lawless lands on the Afghan border. The army said 60 militants and five soldiers had been killed in the first 24 hours of a long-awaited offensive on the global Islamist hub of South Waziristan. Soldiers were securing territory while some militants were fleeing, it said. The offensive follows militant attacks in different parts of the country, including an assault on army headquarters in which at least 150 people were killed. The army says it has surrounded the militants in their main zone, a wedge of territory in the north of South Waziristan, and soldiers backed by aircraft and artillery are attacking from the north, south-west and south-east. Government forces pushing down from the north were clashing with militants in Nawaz Kot town, intelligence officials and residents said. “There was heavy firing until midnight and in the morning I saw tanks moving in and Taliban were firing rocket-propelled grenades," said villager Gul Nawaz, who lives near Nawaz Kot. The army had launched brief offensives in South Waziristan before, the first in 2004 when it suffered heavy casualties before striking a peace pact. Security officials said soldiers advancing from the south-west met dogged resistance from militants in forest-covered mountains as government forces tried to advance from the town of Khaisora.